April | 2010 | Expecto Patronum! Everyone from wizarding families talked about Quidditch constantly. Ron had already had a big argument with Dean Thomas, who shared their dormitory, about soccer. Ron couldn’t see what was exciting about a game with only one ball where no one was allowed to fly. Harry had caught Ron prodding Dean’s poster of West Ham soccer team, trying to make the players move. We’ve gotten to Hogwarts. We’ve met the main characters. Now it’s time for some Wizarding Sport! “The Midnight Duel” is really a transitional chapter between the “establishing” detail of earlier chapters and the main Hogwarts plot. It picks up on hints about Quidditch from earlier chapters and propels the Quidditch subplot forward… and spends most of the chapter developing the Gryffindor/Slytherin rivalry. The intro to this chapter really gives the reader a feel for the significance of Quidditch in the Wizarding World. All the kids are talking about it. Neville is terrified of flying. Hermione, of course, is trying to learn how to fly by reading a book. And Harry is afraid of making a fool of himself in front of Draco Malfoy during the upcoming Flying Lessons. Quidditch through the Ages is one of the most popular titles in the Hogwarts school library. Madam Pince, our librarian, tells me that it is “pawed about, dribbled on, and generally maltreated” nearly every day – a high compliment for any book. The book itself describes the history of Quidditch – the origins of flying by broom, racing brooms, the history of flying broom games, the development and historical changes to the game, the origin of the seeker’s Golden Snitch, as well as the various teams of Britain, Ireland, and abroad. It is a quite comprehensive history of the Wizarding Sport – all crammed in to about 56 densely packed pages. Unfortunately, you can’t learn much about actually flying out of a book, no matter how helpful the tips. So Hermione doesn’t get much benefit out of the text. Harry Potter though – who we soon learn is a natural flyer – will later learn plenty from the book. About Quidditch, not how to fly. Flying Lessons: Gryffindor 1st years take flying lessons with Slytherin first years. Harry vs. Draco: The most prominent 1st year boy in Gryffindor faces off – multiple times in this chapter – against the most prominent 1st year boy in Slytherin. McGonnagall vs. Snape: The Gryffindor Head of House is willing to bend the rules (re: 1st years not owning racing brooms or playing on the House Quidditch teams) specifically in order to show up the Slytherin Head of House. We know that the rivalry dates all the way back to Godric Gryffindor and Salazar Slytherin themselves – the two male founders of Hogwarts – and that it is currently embodied in the battle for the future of the Wizarding World between Albus Dumbledore (Gryff) and Lord Voldemort (Slythie). Yet Hogwarts insists on putting these two bitter rival Houses together in Double Potions and Flying Lessons and even Care of Magical Creatures… yet they can seemingly never get along. What’s the purpose of forcing them together? My personal theory is that these are the dominant Houses, and it’s for the well-being of the other Houses. Can you imagine putting the poor Hufflepuffs in Double Anything with either Gryffindors or Slytherins? 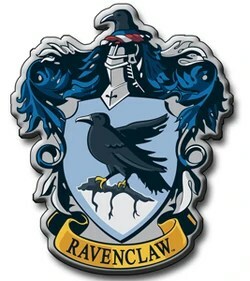 Ravenclaws might hold their own – particularly from an intellectual standpoint – but the Hufflepuffs would, I think, just wither away. Better to put them with the Ravenclaws and let the Gryffs and Slythies fight it out amongst themselves. If anybody has a better theory, I’d love to hear it! Transfiguration is some of the most complex and dangerous magic you will learn at Hogwarts. Anyone messing around in my class will leave and not come back. You have been warned. You are here to learn the subtle science and exact art of potions-making. As there is little foolish wand-waving here, many of you will hardly believe this is magic. I don’t expect you will really understand the beauty of the softly simmering cauldron with its shimmering fumes, the delicate power of liquids that creep through human veins, bewitching the mind, ensnaring the senses. . . . I can teach you how to bottle fame, brew glory, even stopper death – if you aren’t as big a bunch of dunderheads as I usually have to teach. Minerva McGonnagall and Severus Snape are my favorite Heads of House, and their introductions to their first year students are remarkably telling. McGonnagall’s method of communicating is stern, no-nonsense, straightforward, and to the point. In her opening remarks, there are no introductory phrases, no subordination, no compound sentences. The only coordination she uses serves to connect a couple of adjectives or a couple of verbs. 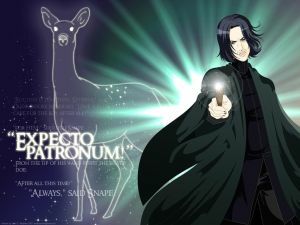 Severus Snape, on the other hand, uses a variety of rhetorical devices in his introduction – from complex and periodic sentences to alliteration, assonance, consonance, and even rhythm. The man could be a rhetorician or a poet were he not a Potions Master. But when, unrhymingly, he illustrates his devotion to Potions, something different happens. He begins to use poetic devices far more sophisticated than mere mechanical rhyme. Notice that in his introduction to Potions, there is a near constant stream of l and s sounds flowing through the passage – a combination of “liquid” and “sibilant” sounds, emulating the liquids being brewed in Potions and the simmering sound of the heat used to brew them. Since liquids – literal, not phonetic ones – are the subject of this speech, it is rather appropriate that phonetic liquids fall into varying positions in the words, flowing over Snape’s syllabic boundaries, just as literal liquids flow over physical boundaries. The sibilants, on the other hand, tend to alliterate – i.e. fall at the beginnings of words. There are also a good number of “stop” sounds in this passage (p, t, k, b, d, g). It may be a bit of a stretch, but thematically, stops phonetically parallel the “stopper” Snape claims he can put in death – one that he literally puts in place to arrest Dumbledore’s inevitable death shortly before HBP begins. The reason I put certain stops together (such as b/p) is that you use the same shape of your mouth to form the sounds. Try it, and determine what you do differently to make the two consonants in these pairs sound different. Of course, sound can serve non-sense. Therefore, it is the sense of Snape’s words that matters most. And what he tells his students in this short passage is that Potions-making requires a subtle mind, precision, patience, and some measure of creativity. It is not big, brash, bold. It requires brains, not brawn. Essentially, he is saying that much benefit can come to the student who perfects this art/science – as he did (and as Harry’s mother did). In her book Bring forth the best robes: a spiritual understanding of Severus Snape, Logospilgrim provides a mystical reading of this passage, taking it apart as a poetic description of deep prayer. I don’t expect that Snape is consciously describing prayer. But the worshipful language he uses about Potions-making certainly makes logospilgrim’s interpretation worth checking out. I guess this blog proves that you can write about Harry Potter for a few months, slowly build an audience, and then the second you write about Severus Snape… BAM! The blog explodes. The other day, Severus Snape finally made his first appearance onstage in this re-read. It wasn’t, however, his first appearance on this blog. In fact, I started the blog right after finishing my first read of the series, while I was trying to unravel my feelings about Snape and Dumbledore. But at that time, the blog had no audience. What happened the other day, though, is that visits to the blog suddenly exploded exponentially. Yes, the comments thread exploded too, but the comments were all from a group of Snape fans that I already knew and had invited to come on by and take a look at the post. That group of fans cannot account for the hundreds of visits the blog has since received beyond its normal audience level. Yes, never underestimate the power of suggestion… and beyond that, the power of suggestion from dreams you don’t even remember! The real villain in the “turban-as-sorting-hat” dream is actually underneath that turban, but in his dream, Harry morphs Draco into Snape and then Snape into Voldemort’s laugh – along with the green light of the Avada Kedavra curse that gave Harry the very same scar that burned when Snape first looked at him. Harry’s unconscious mind is connecting Snape with Voldemort. And even though that association would have been true a little over a decade earlier (when Snape was a Death Eater), it is very far from true now. Harry’s dream closes the chapter and leads in to the first chapter that is actually named after Snape – “The Potions Master.” And that is where we will pick up in a couple of days. But until then, here’s some silly Snape humor. LET’S DANCE! Professor Quirrell, in his absurd turban, was talking to a teacher with greasy black hair, a hooked nose, and sallow skin. “Ouch!” Harry clapped a hand to his head. “What is it?” asked Percy. The pain had gone as quickly as it had come. Harder to shake off was the feeling Harry had gotten from the teacher’s look – a feeling that he didn’t like Harry at all. 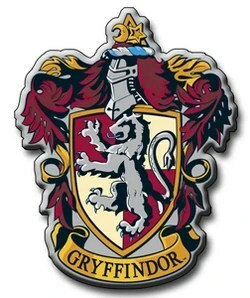 This post is one of the scariest of all posts to write, but being a Gryffindor, I will try to ignore the fact that the comments thread could explode into vituperative rants and the entire blogosphere could fly apart into billions of tiny pieces. I will be brave. I must. The reason this post is so potentially explosive is that the sallow-skinned Professor’s look right here, in this scene, launched a battle that has been raging ever since. Even the fact that this man looks straight into Harry’s eyes could be the spark that ignites the flames that destroy us all! And if you think I’m kidding… just take a look at some of this morning’s discussion (yes, that is me posting as ccollinsmith)! (A word to first-time-Potter-readers: You can still move away from this page right now, before it becomes highly spoilerific!). The opinion that Harry forms right here, in this scene, is the one that stays with some fans forever – long after Harry has moved on, gotten over it, and even… gasp!… named his child after this man. 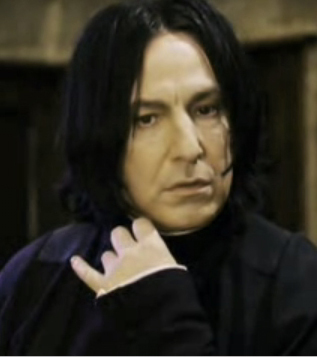 The hook-nosed Professor is, of course, Severus Snape, who will be the seeming villain all throughout PS/SS. In actuality, he is “Mr. Red Herring,” and in this scene he first lays eyes on “Mr. Love-Me-Or-I’ll-Think-You’re-Evil” Harry Potter. Now, I love Harry. Don’t get me wrong. But in the course of this book, Harry will take Snape’s coldness and spin out of it a wild fantasy of horrific misdeeds – of working to steal the Philosopher’s Stone in order to return Lord Voldemort fully to life. Now mind you, Harry knows nothing of Snape’s past – nothing of Snape having been one of the Dark Lord’s Death Eaters, nothing of Snape’s role in the deaths of his parents, nothing of Snape’s subsequent deep and abiding loyalty to Albus Dumbledore, nothing of his hard work behind the scenes to protect Harry Potter. All he knows is that Snape appears to hate him, and therefore he must be eeevol!!! Murderously so. 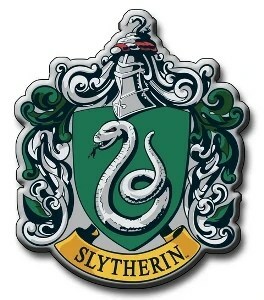 Oh, and of course, Harry also knows that Snape is the head of Slytherin House. When Snape looks into Harry’s eyes and Harry feels the sharp pain in his scar, Harry concludes that the pain must come from Severus Snape. 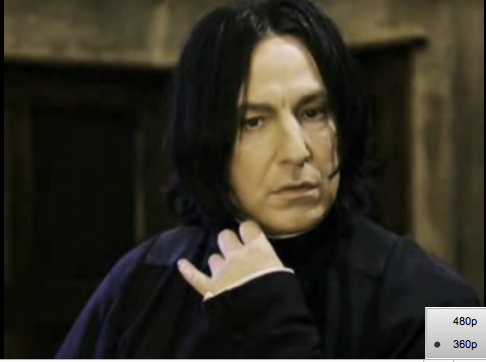 The logic running through Harry’s mind goes something like this: If Professor Snape looks at me and if I then feel pain, the pain must come from Professor Snape’s look. That’s called a “post-hoc-ergo-propter-hoc fallacy” (for anyone keeping score) – or a “post hoc fallacy” for short. What it means is that the person committing the fallacy confuses sequence with cause. That is, if x occurred before y, then x must have caused y. As Hermione will say later in this book, “Most wizards don’t have an ounce of logic.” Harry’s conclusions about Snape in PS/SS illustrate that point quite beautifully. Here, Snape finally sees the boy he has vowed to protect, and see if there is something of the mother in him. And of course what he sees is that ZOMG!!! THE BOY HAS HIS FATHER’S FACE!!! It’s a miracle that he didn’t throw his resignation at Albus Dumbledore right there on the spot and fly shrieking from Hogwarts Castle as fast as Gilderoy Lockhart would run if confronted by a monster! But I’m getting ahead of the story… and Snape is after all no snivelling coward – despite the humiliating nickname Harry’s dad gave him as a boy. At any rate, Snape begins his relationship with Harry by looking straight into the boy’s eyes, and he will end his life looking straight into this boy’s eyes – thus bookending what Harry Potter will ultimately acknowledge to have been one of the most important relationships in the course of his life. Because of the huge mistakes both characters make in understanding each other, the tension that rises between them over the course of seven years, and the conclusions Harry ultimately draws about his most hated Professor, we will be keeping a very close watch on the development of the Snape-Harry relationship.